Some time ago, in response to my 10 November 2011 post, “Free People of Color in Old Virginia: The Morris Family of Gloucester County,” (which I encourage you to read or reread) I received a long email message from Nathan Crowell, who traces his own mixed-heritage ancestry back to Gloucester County. Nathan shared not only his family research with me, but also certain insights that he gained over the years from listening to his ancestors—particularly his grandmother: insights into what it meant to be a “free person of color” in a slaveholding society, what it meant to be defined as “black” when one’s skin was fair. His remarks remind us that life in the Old South was far more complex than most of us realize, and that “race” was an imposed category of human existence that had no rational biological basis, but had very real legal, social, and psychological consequences that shaped the experiences and consciousness of all members of society. With Nathan’s permission, I have created the following post from his remarks. My grandmother was raised in Gloucester County, Virginia, by the family of her mother. Her mother died when my grandmother was six months old. I always have been interested in her family history, and as well that of my other grandparents. So I have slowly and steadfastly attempted to learn what I can. I have traced the families of most of my grandparents back to the early 1600’s, where I found a combination of black ancestors, white ancestors, and so forth. In the process, I have learned an immense amount. I’ve seen that before the Civil War, people were incredibly mobile; they moved across counties, e.g., from Gloucester up to Campbell, and they moved across states, e.g., from Virginia to Ohio. I am from New York, and my visions of the South result from my grandparents’ narratives and my summer vacations “down home.” The South has always seemed to be static, and perpetually unchanged. The mobility of my ancestors however, clearly demonstrates that that perception is indeed erroneous. Still, I had been taught long ago that Virginia was a major exporter of slaves to other states. While many of these slaves undoubtedly were bred just to be sold South, I understand now that there were actually thousands of slaves in Virginia at any one time; and many of the exported slaves were simply surplus from farms that had become increasingly unproductive. It was nothing more pernicious than that. As well, I’ve come to realize that slavery was a lot more complex than I had believed. In the North, the experience is portrayed in black and white—defenseless slaves at the mercy of brutal masters. And even if that worldview is tempered, by literature from the period for example, it is still hard to internalize anything but the degradation and brutality of slavery. However, at the same time there was an intense interconnectedness among slaves, their masters, and everyone else living in the South. As a case in point, I have white relatives whose sole emotional relationship was with a slave; the uncle of one of my great, great-grandmothers, Ned Hockaday, never married a white woman, but had a good number of children with one of his slaves. I have white relatives who had black children right alongside white ones. One of my great, great, great-grandfathers, William Hockaday, had a black son who he named Thomas, and as well, he had a white son, whom he also named Thomas. And then there are my free black ancestors, who were neighbors and possibly tenant farmers who rented land from their white ancestors. Effectively, they were living near, even with, their white cousins. Perhaps most importantly, I’ve gained a much better understanding of who my grandmother was, and that has been very gratifying. My grandmother was very colorstruck, and growing up, I always found it to be unpleasantly odd. Again, I grew up in New York City, and in the seventies, with the emphasis on black pride and galvanizing the black community, there was no space for perceptions of superiority based on relative skin tone. As well, my grandmother was very dark, and it seemed that she took after her father, John Hamilton Boulden, who was pretty dark himself. My other grandmother, and my grandfather too, were, on the other hand, very fair–red hair, freckles, the works. And they never made any mention about skin color differences and certainly, they never seemed to attach any relative importance to lighter skin. So it was really strange to hear my grandmother go on about fair skin, good grades of hair, and so forth. I just wrote her views off as a legacy of slavery, illustrative of the sense of shame and inferiority that blacks took away from the slave experience. And given her age, it did seem logical to do so. I see now that my grandmother’s views were a legacy of her family’s distinctive struggles as well as a byproduct of race-based slavery. I see that free blacks were just a sliver of the black community, with hundreds of them juxtaposed against thousands and thousands of slaves. And I can only imagine the intense pressure they faced in trying to distinguish themselves from those slaves, and thereby preserve their freedom, and any of the rights and privileges that it entailed. It would only make sense for them to fixate on skin color, hair texture, pedigree, and just about anything else that would help them stand apart. Thus, I think that the color prejudice that she learned was less about pride in white ancestors and disdain for African ancestors, and more an integral part of a hard-fought attempt at self-preservation. This is fascinating conversation and it parallels so closely what African Americans shared with me in Jones County, Ms.
Mr. Crowell, my great grandfather John M. Maxwell, along with several siblings and his parents Campbell and Henrietta are on your Ancestry site Paynes of Gloucester/Crowells of Halifax. I had a fourth great grandmother Deborah (Payne) Hill who was freed from her indenture in Pittsylvania County, VA in 1787. Her freedom suit says that she was a free child kidnapped in Maryland in 1779. Do you believe that she was descended from Francis Payne of Gloucester? Am researching a book about my great grandmother who was widowed when her husband was mortally wounded at first Manassas. At the time, Mary E. (Polly) Rice Ranson had five minor children. They were living on a medium sized farm in Anderson County, SC with about eight slaves. Then in 1864 Polly give birth to her 6th child and 3rd daughter who was noted in the 1870 census as white and in the 1880 census as mulatto: father unknown. The story lived on hinted at by my mother and aunt who were daughters of the youngest Ranson son (1859). The five Ranson children were taken to live in Mecklenburg County NC sometime after 1865 and before 1870. I would love some feedback/advice. Mary M. the daughter appears only twice in the written record ( that I have located so far), but lived on in the memory of her half nieces. I am preparing an NEH proposal and any feedback or pointers to key texts would be wonderful. I have yet to find a similar case, Do you know of any? Yvonne Bivins’s history of Vernon Dahmer’s early roots also has similar elements. In fact, several of the essays contained in the “Multiracial Families” category of this blog offer similar stories. Would love to hear from other readers in regard to Virginia’s story. Tunis, TX. I enjoyed reading the info that you have for Gloucester County in VA. Thanks for your post, Brandy. It’s certainly possible that you have a kinship with the Morrises of Gloucester County. Descendants have fanned out far and wide. The Morris descendants that I knew lived in Virginia, Brooklyn, NY, and San Diego, CA. I love reading your blog and have found your postings illuminating on a number of levels. Like many people who have posted comments here, I have been digging into my family’s past and found that the racial history of the South, and more specifically interpersonal relationships across the color line, were far more complicated than what you see presented text books or in popular myth/culture. Luckily I was one of those kids who listened when my grandparents talked, and I’ve been able to follow-up and confirm old family stories through my own research. One of the first things that immediately surprised me was the fluidity of early Southern race relations, the ease with which people slipped across the color line, and how those factors shaped my own family’s history. I had once thought that interracial relationships between white women and black men were rare, but on my dad’s side this apparently happened a number of times, although mostly during the Colonial era in Virginia. I had however grown up hearing about post-Civil War mixed-race relationships on my mom’s side of the family. My grandfather vividly remembered visits from Susannah Miles, his mother’s Scots-Irish grandmother, who had lived with and had children with Issac Baker, a former slave, in Darlington County, South Carolina after emancipation. The couple wasn’t allowed to marry due to the state’s anti-miscegenation laws, but they did seem to have a degree of acceptance from Susannah’s father (the couple lived next door and worked on the family’s land) and some neighbors. I found this especially interesting given that Susannah’s brothers, and possibly her father, fought for the Confederacy. I would love to get some recommendations from you regarding books or other sources I can go to understand what life may have been like for poor, Southern, and rural white women like Susannah. I have heard that Drew Gilpin Faust’s Mothers of Invention is a good place to start. Any other suggestions? Again, thanks for sharing all this great information! I absolutely love reading each and every commentary posted on Vikki’s blog. Vikki is one terrifc historian and also story teller. Nothing stilted in her narratives. And it get’s even better. People like Ed Payne, Nathan Crowell, and many others post their compelling and well told personal family stories. Am I a lucky reader, or what? YES! YES! YES! I love history! !Great article!! 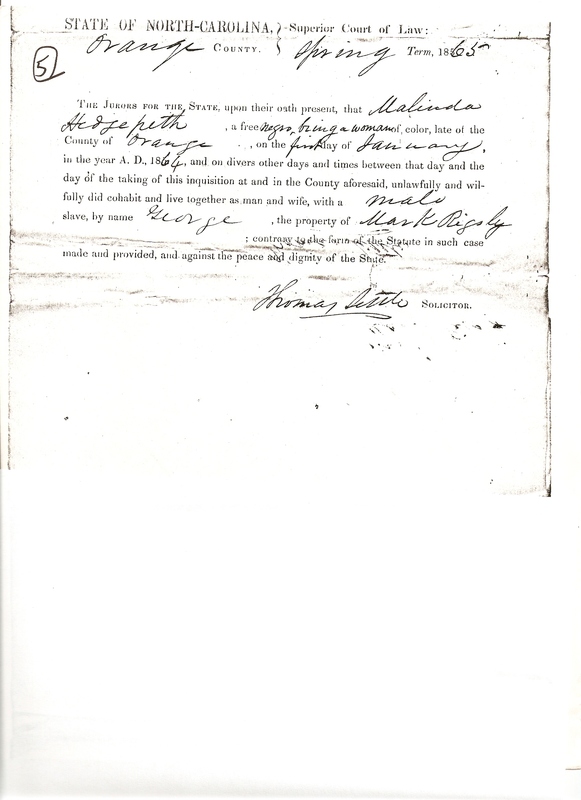 About 3 years ago after searching for my maternal line, I found that my ggggrandfather and ggggrandmother were “Free People of Color.” The James line started out in Virgina into North Carolina as blacks and mulattos and Indians and whites and into Georgia. I had never heard that term ever..I had no idea what “Free People of Color” were. I wasn’t able to find much regarding Virginia to N.C. and Georgia region at this point. It seems like they were more common or had bigger numbers in the state of Louisiana. If you have any information where I might find additional information I would appreciate it. Nice to hear from you, Carolyn. Have you checked the federal manuscript censuses when tracking your James ancestors? Also, local records are a goldmine. I spent a year in the NC State Archives, where I tracked many “free people of color.” Before the Civil War, they were required to regularly register their freedom in the county courts. If they owned land, they’ll appear in property and tax records. Civil and criminal action papers offer lots of information on ordinary people–whether or not they ever broke the law. They are listed as witnesses, victims, etc. It’s a tedious process, requiring hours and usually days of research.You usually have to visit the state archive of choice and register as a researcher, but the rewards can be great! Carla, I will try to contact Mr. Crowell and Mr. Driver and ask if they are able to help you with your research. I’m not sure, however, that I have current contact info on either of them.